We were grocery shopping. I was in a massive hurry. Yes, I do realize I operate in a constant state of “massive hurry” and so this is not exactly new. I only bother to state the fact to illustrate the oblivious mental state I must have been in when I told Lindsey to move forward or I’d run her over with the cart. I was joking, honest. We were in the check out line and I was trying to add the things from the bottom of the cart to the moving conveyer belt and she was in MY way. I needed to get home and dinner was way behind schedule and there were poster boards in the car for homework projects still needing lots of glue and glitter or whatnot added to them yet, and so time was of the essence. What I failed to see was who was in HER way, preventing our forward progression. There was an elderly gentleman, stooped over picking up pennies he had dropped in his hast to make way for us. She stood watching him unsure what to do. I said nothing to her. She is nearly 13 and no longer a child. Telling her to help the man would embarrass her. It was time for her to figure it out on her own. He was flustered as his fingers scooted the coins across the floor instead of picking them up. He tried to hurry but the more he tried to be quick, the more his fingers refused to obey him. He gave up and waved a leathery hand at them and smiled a worn smile at the bag boy and said “Oh well. No matter.” Lindsey dipped down and had the coins in her palm in seconds and shyly handed them to him before he could turn around. Not once did the bag boy think to help the man. But my daughter hesitated not a second. The man looked up into her eyes and the surprise and thanks spread across his face in a grin and he bobbed his thanks to her as he backed out of our isle and disappeared into the rush-hour crowd. At times like this, I always wonder… I always wonder if only for a second… if those crinkled old eyes were the eyes of Jesus with skin. 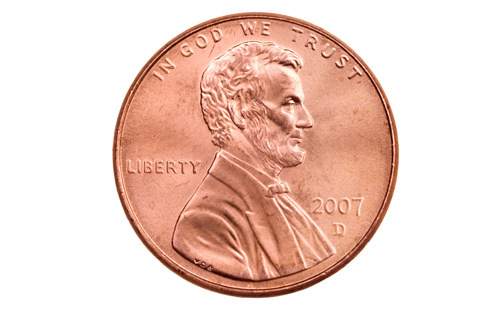 What if we all picked up a penny the next time someone dropped one ahead of us? What if we slowed down and weren’t in such a hurry… and said hi to the cashier FIRST because we cared AND made eye contact, asked the waitress how we could pray for her today as we said grace over our meal she was bringing us, told the frazzled mother of the rowdy toddlers that she really WAS a good mom, or the gas station attendant a simple thank you and meant it? Sometimes it is the unexpected little “nothings” that make the biggest differences in someone’s day. Like my daughter so clearly reminded me, it just feels good to be a light in the world, to be used by God in an unexpected way.